Architecture student Roman Zastavskiy and President Rich Wagner assemble a chair model created using a laser cutter. 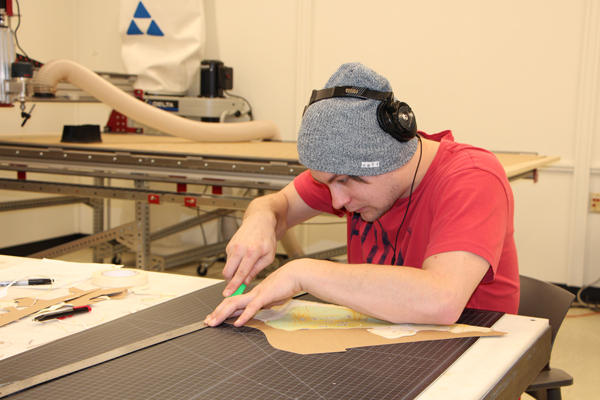 Students in Architecture, Interior Design, Construction Management and Graphic Design now have access to a new, state-of-the-art fabrication lab located in Red 67. Rocky Phandanouvong and Tyler Barres. The “fab lab”—also referred to as “digital fabrication lab” (dLab)—is a hands-on laboratory that provides students with the necessary resources for material testing, prototyping, product design and development, visualization, and digital fabrication at all scales. Among the fab lab’s tools relevant to the architecture industry are: model making and prototyping tools (laser cutter/engraver, small sander, small table saw and dremel); full-scale fabrication tools (CNC router); and product design and development tools (3D printer). 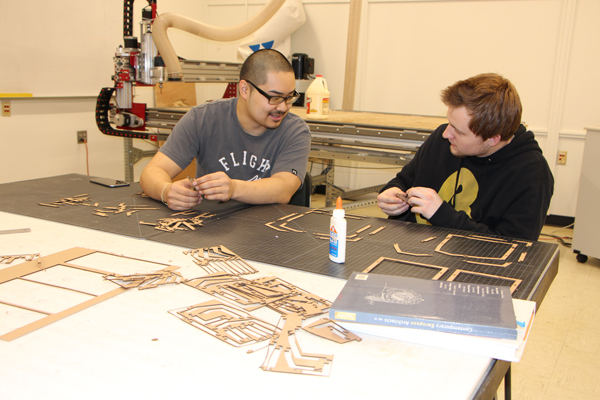 Future fab lab tools will include a large format laser cutter, vinyl cutter, mini mill and portable 3D printers. 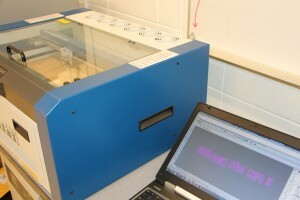 Interior Design students will use the fab lab for prototyping and testing product concepts for improvements and innovations. “The actual making helps to reinforce a true hands-on educational experience unique to our college—and so important to our students learning,” said Interior Design Principal Instructor Colleen Schmaltz. The Graphic Design department will use the fab lab to cut larger retail display components than their new Kongsberg V20 table can handle and also to possibly create 3D-printed prototypes to stand in as product samples and enrich the package design process. Rivard added that the programs all sharing materials will make the procurement of materials more cost effective for the College. The fab lab was funded largely by private donations through the Dunwoody community of donors as well as a matching grant from First Technologies. 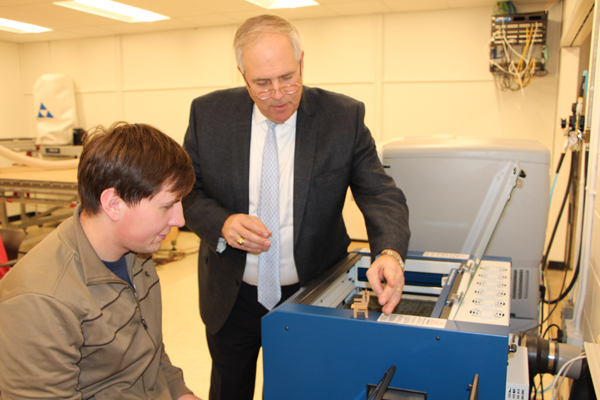 “We are applying for an annual grant to continue expanding the lab and are hoping to eventually integrate the fab lab with the materials lab, currently on the Green Level, and house all of them on the Red Level,” Dwyer said.